A historic lack of political representation in Colombia’s political system is one of the key focuses in the ongoing social, political and economic struggle of the Afro-Colombian community. With 5 million people, or 10.6% of the total population, Colombia has the largest Afro-descendant population in Latin America, behind only Brazil, according to a 2005 census. There are, however, serious difficulties in quantifying blackness, given the mixed ethnic backgrounds of many Colombians. The stigma associated with African descent in much of the country leads mixed-race individuals to identify away from their Afro roots, and unofficial figures place the Afro-Colombian community at as high as 25% of the total population. In comparison, Congress, comprised of a 102-seat Senate and 166-seat House of Representatives, only holds two reserved seats for Afro-Colombians in the lower chamber. “In Colombia, there is a great lack of [Afro] political representation, in the different instances of power and decision-making at the national, regional and local levels,” said Edwin Salcedo, a Senate candidate for the Green Alliance (Alianza Verde – AV) and longtime Afro-Colombian rights advocate, in an interview with Colombia Reports. “Today, the Afro-Colombian legislators are comprised of 12 or 13 representatives to the House and Senate, representing 3.2% of all Congress,” said Salcedo, who has served in the House as one of the designated Afro representatives, and was instrumental in various civil rights struggles in his native city of Cartagena, on the Caribbean coast. Although the Afro-Colombian population has previously gained some traction in the decision-making process in the country, factors such as political fragmentation and underrepresentation has hindered its ability to fully advance within the nation’s political system. “The problem begins with this because how is it possible that five-million people are represented by just two people in congress,” the senate candidate said. Colombia was first recognized as a multi-ethnic and multi-cultural country in 1991, when the so-called Constituent Assembly drafted the first national Constitution since 1886. The Constitution became something of a milestone for Colombia’s indigenous peoples, with two representatives elected to help craft body. Gains, however, were minimal, and only five potential seats were reserved for other minority groups. “The indigenous sort of gained an advance on Afro-Colombians by getting reserved senate seats […] where Afro-colombians did not,” said Christopher Sabatini the Americas Society/Council of the Americas (AS/COA) Senior Director of the Washington-based think-tank, Christopher Sabatini told Colombia Reports. In accordance with article 176 of the National Constitution, we establish the special circumscription to elect two members of the black communities, securing their participation in the House of Representatives. But in 1993, the perhaps most critical piece of legislation for the community, Law 70, gave Afro-Colombians two reserved seats in the House along with the right to claim ancestral lands along the Pacific coast. These lands were to be governed by semi-autonomous political entities, and the law also established government programs to improve education access and protect cultural identity. Still, studies show, and social organizations confirm, that the Afro-Colombian community continues to suffer disproportionately from issues such as poverty, violence, and poor social services. The AS/COA’s most recent report, moreover, raises serious questions as to Afro-Colombian inclusion in society, especially in the political sphere. Between 2002 and 2010, according to the study, only two bills proposed by Afro-Colombian representatives directly affecting the Afro-Colombian community were approved. Within this period, Afro-Colombian legislators proposed 25 such bills. Other lawmakers had better relative success, as was the case with the Anti-Discrimination Law, which imposed prison sentencing for acts based on discrimination of race, ethnicity, sexual orientation or nationality. “Most of the laws have been symbolic, whether it is sort of creation of recognition of their race or ethnicity, scholarships in regional universities, those things have been the typical types,” Sabatini said. One counter example would be a law requiring the state and private enterprises to consult individual Afro-Colombian communities on any economic, environmental, infrastructure or natural resources projects that could affect their territory. Even in this case, though, there are caveats. The Afro-Colombian community has long been a target of illegal armed groups operating in the country, and crimes committed against these populations are often met with impunity. Most Afro-Colombian communities are located in areas rich in resources, primarily along the Pacific and Caribbean coasts, regions well-known for their biodiversity, fertility and, in the case of the Caribbean especially, great mineral wealth. Despite the strong Afro presence in these regions, these communities enjoy very little political representation, and accordingly, receive little top-down attention directed toward their economic and social development. The lack of resources allocated to Afro communities, even in regions where the population is particularly prominent, can be tied to this divide. 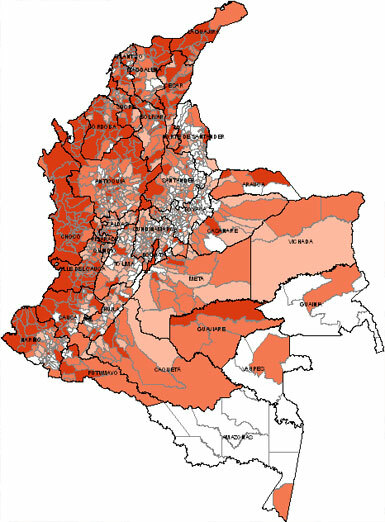 “Development of a community is very much influenced by political power and those who do not have power politically, do not have the possibility to develop,” said Salcedo who previously worked with the U.S. Agency for International Development (USAID) on the first study to determine the economic participation of Afro persons in Colombia. Because the idea of reserved seats, though perhaps well-intentioned, has never been tied to the actual proportion of the Afro-Colombian population, it has undermined its own stated goals, limiting participation of Afro persons to the limited spaces guaranteed them by law. Moreover, the reserved seat policy has not helped the communities integrate into the national party structures they have been traditionally excluded from. “Because the seats are set aside, [the candidates] can run on their own. They’re not required to forge alliances with the various political parties and that hampers their overall integration into the national political system,” Sabatini said. The result has been political fragmentation, as small Afro-Colombian parties have a limited political voice in congress and larger parties tend to under-prioritize an Afro agenda. The challenge for activists, then, is to devise a system that effectively promotes Afro participation. Under this proposal, Colombia would set a quota tied to the larger Afro-Colombian population. Where a pocket of reserved seats falls noticeably short, argues Sabatani, this policy would achieve in mandating the integration of Colombian politics. Salcedo also sees this as a viable solution. “If there was a plan that in each of the parties, by obligation, would have certain percentage of Afro representatives, that could be able to make [political participation] how it has been done with women, that through obligation, they have to have a representative in all of the national, regional and local lists.” As Salcedo points out, Colombia does have such a law in place for women. Because the mandate is not proportional to the general population, however, female representation in Congress still falls well short of actual demographics. “All of these themes have to be put in a public light, because there is a problem with the state,” Salcedo said. With national congressional elections set to take place this Sunday, Salcedo is one of only a handful of Afro candidates running under big party tickets.